­Drivers with the Unite union working for fuel-distribution companies whose customers include large grocery chains such as Tesco and Sainsbury’s voted this week to strike in protest at working conditions and changes to their pensions. This is hardly a relief for ordinary drivers and the government’s self-contradictory attempts to prevent industrial action are only fuelling panic on the streets. 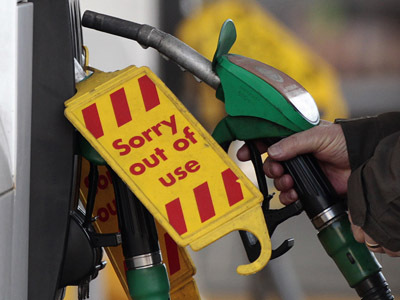 Petrol and diesel sales are spiking as concerned motorists flock to fill their tanks to the full. Dorset police this afternoon called for petrol stations to temporarily close where there is queuing because of panic buying. Experts say the government should take a crack-down as the mood is bad and the appetite for striking in high in the U.K.
Dave Ernsberger, global editorial director with Platts told RT “The concern here is that if the strike action takes hold, retail prices could rise very quickly indeed -though it will be just a retail rise, certainly not affecting the price for crude oil. On the other hand, the serious problem is that the U.K. is only a hair’s breadth away from a double-dip recession, and if this strike goes ahead and retail prices for gas and diesel move much higher that could be the tipping point that would push the U.K. into a catastrophic recession and really challenge the British government with its austerity plan that it has in place” says.